Rep. Mark Meadows to Speaker John Boehner: "Vacate the Chair!" North Carolina Congressman, Mark Meadows, has filed a House Resolution demanding that John Boehner vacate the Speaker Chair of the US House of Representatives. Every conservative in this country needs to contact the Capital switchboard, (202) 224-3121, voicing our support of this resolution. 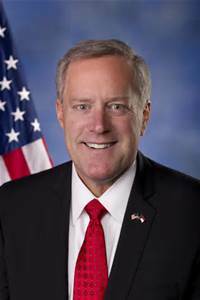 We also need to contact the office of Mark Meadows, (202) 225-6401, to assure him that we wholeheartedly support him in this action. Full text of the resolution is below. Declaring the office of Speaker of the House of Representatives vacant. 2 Representatives is hereby declared to be vacant. Last night Carly Fiorina gave a major foreign policy speech to a packed house at the Reagan Library in California. The speech lasts about 27 minutes and the rest of the video is Q&A. It was an excellent speech and the audience gave her a standing ovation. I read an article yesterday that said she has reached the top 10 in two recent polls so she may be included in the Fox News Channel debate on August 6th. Yesterday afternoon, while still on the job, I downloaded Rush Limbaugh's podcast from earlier in the day. A few minutes into the podcast, Rush told the audience that there was to be a guest on his show at the top of the second hour. He said he had invited Senator Ted Cruz (R-TX) to come on because of a floor speech Cruz had given earlier that morning where he called out Senator Mitch McConnell (R-KY) for lying to him and all other GOP Senators about reinstating the Export-Import Bank (Ex-Im Bank). My jaw nearly hit the floor!! I had never heard of this happening before. It is a real life "Mr. Smith Goes to Washington" moment in the US Senate. Cruz also appeared on The Mark Levin Show last night and both Mark & Rush played excerpts from the floor speech but this is history that we all need to see for ourselves. I've also added his interviews with Rush and Levin. Fantastic! "I'm running for President and I hope to earn your support!" This is the man I have been hoping would throw his hat in the ring and he is the first Republican to declare his candidacy for the 2016 race. He is the most conservative candidate in the GOP field, he is a true Constitutional scholar (unlike Obama) and he is a true believer in Jesus Christ. These three points are very important to me when considering any candidate. I could write about dozens of other characteristics, principled stands and courageous statements made by Cruz since he first ran for Senate in 2012. I will be contributing to his campaign and will vote for him in the GOP primary. Quite a few people have wondered why Cruz would announce his candidacy on March 23rd. It's quite simple. It's the anniversary of the disaster known as ObamaCare. Below is a speech he gave at Liberty University this morning where he formally announced his 2016 campaign. Please, visit his campaign site here.